A2K - A Seasonal Veg Table: I make good soup! I know everyone has a good carrot recipe, so I won’t say very much about this, other than it is lightly spiced. Heat the oil and then add the onions and cover and cook over medium heat until the onions have softened. Stir in the carrots, potatoes, garlic and spices, stir well and cook for a further 5 minutes, then add water or stock and bring to the boil. Then reduce heat and simmer covered for 20 – 30 minutes or until the vegetables are tender. Remove the soup from the heat and puree half of it, return to the pot and reheat. Season to taster and stir in optional coriander. Oh weird, I made exactly and I mean exactly the same soup last week when my mum was over. It morphed from carrot and coriander soup into this, with all the same spices. The only difference is I only used fresh coriander. 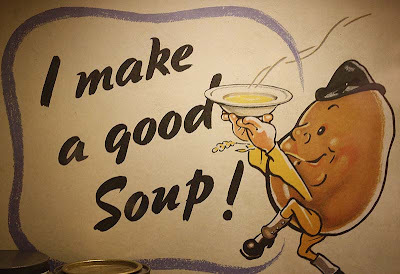 That looks like a really hearty soup. That looks delicious. I have carrot, lentil and tomato soup bubbling right now but that is definitely the next soup to be made in my kitchen. I can't wait to fix this gorgeous recipe! 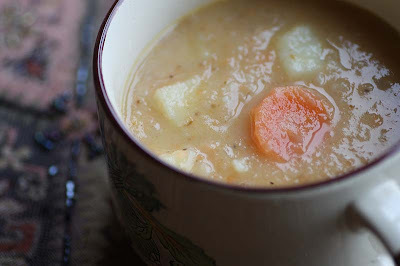 The weather has stayed unusually cold here, and this soup looks like the perfect way to warm up!! Thank you Louise. It certainly is soup weather - still! I hope the weather changes for the good for you. The past two days have been rain free, but still bbrrrrrr cold. I like the use of herbs, my soups use different herbs, so I'll be giving this one a go. Awesome soup. Loved the color and the ingredients too. Addition of coriander would enhance the flavour. I agree fresh herbs are a must in soups. I agree coriander would have enhanced the flavour more.